I think this topic is a big question all the time! First of all we make up artists are human beings like you clients. We have feelings like anyone else and also like respect and appreciation. We are not plastic surgeons and robots! Because most of the clients are not clear with the realistic expectations. What makeup can do and what not? Lets clear up why are we using makeup? We are talking about classical glamorous looks. We are applying makeup to enhance the natural beauty of the face and correct the imperfections! Thats it easy and simple. The makeup will not make you look like Kim Kardashian or Jennifer Lopez or who ever…. You don’t want to hide behind a mask created of foundation. And of course much more!! Unfortunately nowadays we are facing these unrealistic expectations. And what will happen at the end you will get a “bad makeup artist” reputation because you can’t make a Kim from everyone. Well ladies just to inform you this is not working like that. First of all you need to be clear with yourself what is possible to bring out from your face and what not. Thats why we are here … the professional makeup artists! You know that you are going for a makeup appointment so PLEASE DONT WEAR MAKEUP! And now you’re asking why? All of us want happy clients happy client equals happy makeup artist! The makeup will be perfect on a clean face and thats why there is no point of applying makeup for the makeup appointment. Anyway the makeup artist will clean up your face and of course the mascara is a nightmare to clean up and after reapplying again. So make our lives easier and come with clean and moisturised face for your appointment. 2. Research your artists work before you book an appointment!As i said before we are all human beings with feelings. Bad comments and judging before even starting the makeup on your face is really painful for us! As for anyone else. If you know the artists work and you book an appointment with her or him you can be sure that you are in good hands and you dont have to judge or question every single move what she or he is doing! If you are booked in at 2pm please be there at 2pm. Not 1.45 or 2.30 or other time. We are working on time…and time is a very precious thing. Being late is not a condition its a choice. All of us we know the conditions of the traffic, time, etc… so be prepared and be on time please! You are late and now you are rushing your artist to do a magic on your face for 15 minutes. Im really sorry ladies but this doesn’t work like this. A good work needs time. If you know that you will require a glamorous and complicated makeup don’t expect to be ready in 15 minutes! 5. Don’t judge the makeup from a foundation! The makeup in process can’t be judge. All of us, artists we have a different style of application. What you do at home in your bathroom, or watching you tube videos is one thing. The other is when you go to a professional and she or he will do your makeup. It will look different and its absolutely normal! 6. When we say close your eyes that means close it and don’t open till we say open. Opening your eyes can destroy the texture of the eyeshadows especially if we are working with Aqua (watercolours). So please follow the instructions of the artist. We know exactly what we are doing! In my opinion this is one of the most important factors in this relationship. Without trust you will destroy the artists life and experience, as well as yours also. No one wants to leave the makeup appointment with bad feeling, terrible experience and even tears in eyes. To avoid this discuss with your artist the desired look, the occasion, dress, style everything so there won’t be any misunderstanding and disappointment. The makeup application should be a nice and relaxing experience. All you need to do is to sit, relax and enjoy. The rest is on us! 9. You asked for the price. And you got it. The following question: No discount? or What is your last price? Dear ladies that makeup artist paid for her studies, paid so much money for her makeup set and brushes. Energy, time and experience. All this and most of the time we are talking about discounts and last price. Please respect our work and effort! We are working hard to make you look the best as you can. Asking for discounts all the time and saving money on the makeup makes our work less important and not respected. Whatever you do, wherever you go the first thing you will check on the others is THE FACE! Not the dress, shoes, accessories, hair etc… but THE Face! When you talk to the people they will look at your face as they are talking to you… not to your dress or hair! On your wedding you are the center of attention so you want to make sure that you look absolutely perfect! So start from your face with a perfect MAKE Up! 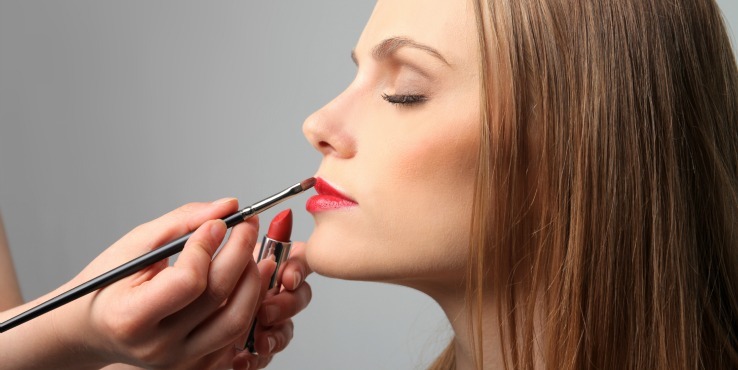 The answer to the second question is doesn’t matter how simple makeup you want it still takes all the steps…foundation, corrector, concealer, powder, eyebrows, eye shadows, mascara, blusher and lipstick. The difference is between the application technique and intensity in colours, but we are still using the same products and doing the same steps. So thats why you are paying the much money even its a simple look. Absolutely no! Everyone can live without a phone for maximum 1 hour. Using phones, taking selfies while doing the makeup is not only annoying for the artist but makes our job really difficult. Let us do our job and after the makeup you can take really good selfies with your beautiful makeup on! No OFFENCE to anyone… this is just the 17 years experience and the every day happening in this makeup artist life. These are just simple tips how make our lives easier and to make sure both sides are happy and satisfied.